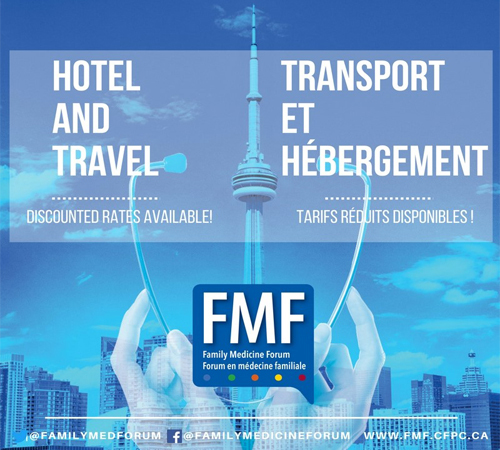 Fly, drive, or take the train with discounted rates for FMF! It’s time to start planning for November! Bettering your practice is always a priority and Family Medicine Forum (FMF) can help you achieve those goals. That’s why we have secured discounted rates on flights, rail travel, and car rentals to make it easier for you to attend FMF. We have also reserved blocks of rooms in Toronto-area hotels for your convenience. The accommodations are close to the Metro Toronto Convention Centre and range from luxury hotels to boutique-style settings. There is something for everyone and every budget. Most hotels include free Wi-Fi, and our special rates apply both three days before and after the conference. Why not extend your stay in Toronto? Shopping on Queen Street, taking in the stunning skyline, attending the theatre or a sporting event … There is so much to do! Visit the Toronto Tourism website and explore the possibilities. Hotels tend to fill up quickly. Book soon so you don’t miss out on the discounted rates at your preferred accommodation! View the travel discounts and list of hotels here.